The exterior of the kamidana. E388. The object labeled E388 and titled as “Wooden Shrine” in the Luther College Anthropology Asian Collection most closely resembles a Japanese kamidana. Kamidana literally means “god-shelf” and serves as a place to worship the kami, often translated as “deity.” The small structure is also accompanied by a small figure that appears to go in the structure. This concept of worshiping kami and use of kamidana stem from the indigenous Japanese religion Shinto. Shinto experienced a strong revival by the Japanese government during the Meiji Era 1868-1912, when this piece was dated, as a part of Japanese Westernization and nationalism. Kamidana was an invention around the early Meiji or late Tokugawa Eras during the beginning of this rise of nationalism and State Shintoism. Because of the resemblance to a kamidana and because it was made during the Meiji Era, the object E388 was most likely built as a result of the Meiji Shinto Revivalism during the 20th century. Though this particular kamidana is different, most kamidana are set up quite similarly to shrines and can be easily seen as a miniature shrine. Inside, both of these structures typically contain nothing except an altar with a mirror, but a shrine may contain certain regalia while a kamidana may have a charm. The same offerings can be made to both, which include rice cakes, vegetables, fruit, sake, and branches of the sakaki tree. Another of the similarities is the recommendation that before approaching and praying at the shrine and kamidana that one should cleanse himself to promote a feeling of purity. The idea of kami is a concept of the Shinto religion, which is indigenous to Japan and is unique in that it is an exclusively Japanese religion. While kami is usually translated as “god” or “deity,” it actually has a broader meaning within Shinto. When one feels a sense of awe or exuberance when experiencing nature or almost anything such as literature or music, Shinto calls the power that comes from this feeling in people tama, mi, or mono. The presence itself is referred to as kami. Often natural places will have this powerful presence, in which case it is marked with a tori gate or a shrine. The popular translation of kami most likely comes from its associations with a traditional practice that was more relevant to prehistoric Japan of appeasing the forces of nature. These forces of typhoons, earthquakes, and volcanoes are most certainly awe-inspiring and have enough power of their own to become personified. Similarly, other especially beautiful or awe-inspiring natural occurrences or locations inspire personification, which looks quite similar to the worship of a deity. The worship of a deity and kami look similar in this context, but not quite so with a kamidana. There seems to be a lack of an awe-inspiring landscape in relation to the kamidana since it is placed in the home. However, if one remembers that kami sometimes refers to only the presence of that feeling of awe, the purpose of the kamidana makes more sense. The purpose of the kamidana is not always straightforward even to Japanese people themselves, but overall the purpose seems to be that they are inviting this presence of the kami into their home in hopes for good omens. A Different Kind of Kamidana? Base of the kamidana. E388. This particular kamidana however, is different from most kamidana. 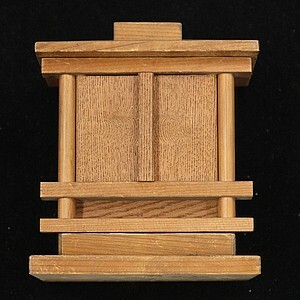 It is recognizable as a kamidana because of its miniature shrine appearance and because it is made of wood, but that is where the similarities end. Most kamidana, though intended as a small scale shrine, are larger than E388. Not only that, it is missing the common elements listed earlier of most kamidana, such as the mirror or the charm, and instead has a small deity-like figure which seems to go in the shrine, but is not a typical custom of Shinto. Considering that kamidana are meant to be placed in the home, homeowners could have their own say in how they were arranged. They customized and arranged their kamidana to their personal worship. Ono, in her book Shinto the Kami Way, even explains that, “The size and quality will depend on the financial ability as well as on the faith of the head of the household.” Kamidana had the potential to become very personal forms of religious expression even though there is already an accepted general layout. 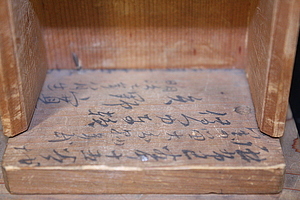 This inscription reveals that this kamidana was given to this boy, Hiroshi Yano, in 1876 on his fifteenth birthday, most likely as part of the common celebration, the Coming of Age Ceremony. The ceremony celebrated the passage into adulthood, and during the early Meiji and Tokugawa Periods, this happened to boys at the age of fifteen. In this celebration, it would be unusual to receive a kamidana as a gift, but again, just as with the arrangement of the kamidana, there is a popular way to celebrate the Coming of Age Ceremony, but there are no rules that have to be strictly followed. Because of the unusual nature of the gift, this suggests some level of personalization and so Hiroshi Yano most likely received this kamidana as a gift from his parents or grandparents as part of the celebration. Furthermore, this type of small kamidana would probably have been handmade and given the context of the celebration, it was probably made by whoever gave the kamidana to Hiroshi Yano, adding another layer of personalization. These levels of personalization bring into question the deity-like figure and where he fits in. 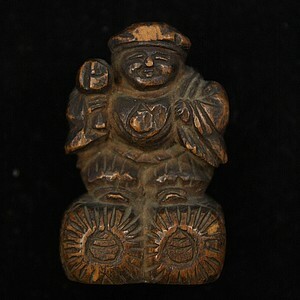 This figure most closely resembles one of the well liked Seven Gods of Luck, Daikokuten. He is most often portrayed with a mallet that grants wishes and a sack with meat slung over his shoulder, sitting on a couple of rice bales, which fits the description of the figure quite well. He is the guardian of farmers and the god of wealth, and his wealth and good-nature are such that he cares not at all. The eighth year of the Tenmei Era was 1788, and the second line indicates that it was the year of the monkey, which is considered to be a lucky year. November was the beginning of the new year, which was lucky in itself. Seeing as Daikokuten was one of the Seven Gods of Luck and the god of Wealth and that his figure was made on a lucky day in one of the luckiest years, this figure was most likely thought to have brought good luck to those in possession of it. However, the dates may not be entirely accurate because the maker might have wanted the figure to appear even luckier than it already was, making it desirable for people to buy or possibly so that he could raise the price. If the date was accurate and given the already personal aspect of the kamidana, it might suggest that Hiroshi Yano’s family may have owned the figure for nearly a century and passed it down for good luck. 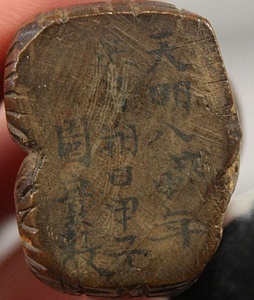 Base of the Daikokuten figurine. E388. With this evidence, there is still some doubt as to whether the Daikokuten figure belongs in the kamidana or not, or if this small shrine is actually a kamidana. The only similarities between it and a traditional kamidana are that they are both small, wooden, modeled after a shrine, and seem to belong in a home. What makes it more puzzling is that the Daikokuten seems to be related to it, but within the Shinto religion, figures of the deities do not belong in the shrine. Despite the explanation as to how these objects came into being, with this evidence, it is uncertain if these objects fit the traditional kamidana role. However, maybe there was no traditional style of kamidana at the time this one was made. According to most scholars, kamidana seem to be of recent origin either in the late Tokugawa period or in the early Meiji period as a result of the Meiji government’s effort to establish State Shinto. As a kamidana of the early Meiji Period, this would make Hiroshi Yano’s kamidana one of the earliest kamidana created. This would explain why it does not fit all the norms a traditional kamidana today but still could be considered a kamidana. Yano’s kamidana has a deity figure that goes inside, which is unheard of for Shinto shrines and kamidanas. In addition, his kamidana does not include any of the normal regalia such as the mirror, sakaki branches, or offerings, but there are still the significant similarities of the untreated wood material it is made of and the shape of the structure and its use in the household. It could be proposed that Yano’s kamidana was made at a time when there may have been no set standard for a kamidana set in place or when the standard that is commonly practiced today may not have been quite as common yet during his time, which would explain the inconsistencies in his kamidana with the kamidana today. During the late Tokugawa or early Meiji Period when the kamidana was made, the government was transitioning from the Tokugawa shogun and bakufu system to the Meiji government’s center on the emperor and the rise of nationalism in the form of State Shintoism. When the Commodore Matthew Perry landed on Japan’s shores and forced Japan to open its borders in 1854, Japan not only opened itself to a new market of goods but a new market of ideas, too. Japan, being closed off from the world for centuries during the previous Tokugawa Era, realized how far behind it was technologically and rushed to copy Western Europe and Westernize in hopes that it had not fallen behind for good. In order for Japan to catch up technologically to the West, it needed to also adopt the West’s ideas, one of which was nationalism. Nationalism proved to be a good tool to unite Japan under the emperor and make effective use of its citizens during this time of rapid industrialization and Westernization. However, implementing it presented a problem because of the early and significant Chinese influences on Japan throughout its history. Shinto solved this problem though: it was a religion indigenous to Japan and existed even before the Chinese came to Japan, never mind that current Shinto had been heavily influenced by Daoism, Confucianism, and Chinese Buddhism. During the period 1868-1889, Meiji oligarchs attempted to establish National Shinto as a state religion with a nationwide system of shrines and official priesthood. Shinto, as a newly organized religion, now had the status of a government ministry. Along with this came the separation of Shinto from Buddhism and the consequent persecution of Buddhism and Christianity throughout Japan. Buddhist funerals, which were quite popular throughout Japan, were banned in favor of Shinto funerals which had been forgotten and unheard of at that time. In the Charter Oath of 1868, the emperor claimed that the indigenous form of government as exemplified by Jimmu would be restored. In the Shinto creation story, Jimmu is said to be the first emperor of Japan and the son of the god Amaterasu, who gave birth to Japan. By incorporating Shinto mythology into the government, not only was the emperor reinforcing Shinto ideology, but allowing himself to do as he pleased seeing as there were no actual historical records to prove what sort of state the government was in under Jimmu or if it actually existed. This intense push for State Shinto was not widely accepted and quite unpopular. In 1871, the Bureau petitioned to abolish the Shinto Ministry and instead to establish a Ministry of Religion and Education, and in 1881, Buddhist priests petitioned the government to stop controlling religion. Finally in 1889 with pressure from the outside world and at home, the Constitution granted qualified religious freedom to all Japanese. However, the government then made the brilliant move to transfer religion from the home to the classroom. Before the 1870s, education primarily consisted of Confucian ideals, but by the 1880s it became a blend of Confucian and Shinto ideology. History classes became mandatory for six years instead of the previous four, where students could learn more about the birth of Japan by Amaterasu. While practicing religion at home was not compulsory, education was, and by moving Shinto to the classroom, the government made sure that all students were receiving this state-funded Shinto ideology. Though there is no concrete evidence, it seems likely that the invention of kamidanas are a result of the sudden political instability of Japan and its attempt to unify in the form of State Shintoism. Because kamidanas are meant to go in the home, this could be a probable result of the Meiji government’s attempt to force Shinto on all its citizens and a form of controlling citizens’ ideologies through Shinto ideology. Because of object E388’s resemblance to a kamidana and the date in which it was made, it was most likely built as a result of the Meiji Shinto Revivalism. Not only does that explain the design inconsistencies of E388 as compared to a typical kamidana today, but also puts it in the larger historical framework as one of the earliest kamidanas created as part of this Shinto revivalism and nationalism. Not only does it open a window into Japanese social customs, it opens a much broader window into an important turning point in Japanese history of political social upheaval. A research project by Joie Tanaka ('16) done in 2015. Beasley, W.G. The Rise of Modern Japan. New York: St. Martin’s Press, 1990. Harootunian, H.D. Toward Restoration: The Growth of Political Consciousness in Tokugawa Japan. Los Angeles: University of California Press, 1970. Kasulis, Thomas. Shinto: the Way Home. Honolulu: Hawai’i Press, 2004. Ono, Sokyo. Shinto the Kami Way, collaborated with William Woodard. Rutland. Vermont: Charles E. Tuttle Co., 1963. Piggott, Juliet. Japanese Mythology. New York: Peter Bedrick Books, 1982. Smith, Robert. Ancestor Worship in Contemporary Japan. Stanford: Stanford University Press, 1974. Yamakage, Motohisa. The Essence of Shinto: Japan’s Spiritual Heart. Trans. Mineko Gillespie, Gerald Gillespie, Yoshitsugu Komuro. New York: Kodansha International, 2006. Translations courtesy of Chikako Kamimura, adjunct instructor of Japanese and teaches calligraphy at the University of Memphis, and Hiroshi Tanaka.